I think I’d describe the overall feel of this outfit a bit like updated 50’s chic. Something about it just makes me think of the 50’s look but much more relaxed and updated. So this is my first non-white Christmas. I lived in Maine for the first 18 years of my life, and just a few months ago moved out here to Arizona to attend university. It’s such an overwhelming difference. No snow is the big one. Went to see Yes Man at the movie theatre with my parents. I didn’t expect it to be very good (and it wasn’t great, though there were some pretty funny bits), but I had to go because of my girl-crush on Zooey Deschanel. Oh and you can’t really see it in the picture (if you look closely enough at the hand on my purse maybe you can see) but I must do a little self-indulgence and tell you what is on my wrist. It’s a bracelet made of guitar strings…played by Pete Townshend of The Who. Yes, they are my most favorite band of all time (just got to see them live in early November, though sadly lacking the two deceased members, Keith Moon and John Entwistle). It was $300 at the Rock and Roll Hall of Fame in Cleveland, and my mother bought it for me as a graduation gift when we went there. If it was a person, I’d marry it. Nice combo with the belt and shirt. Well done! Yay! I love this so much!!! 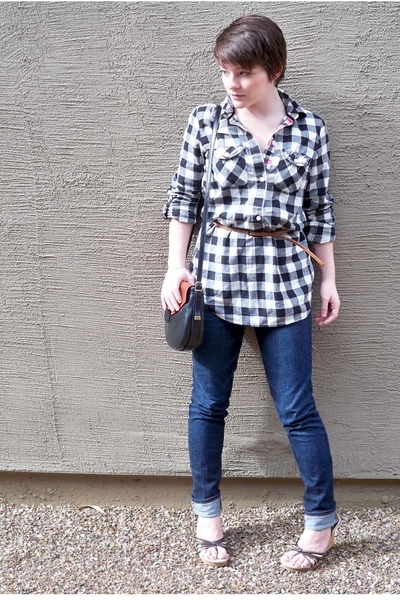 theweeone is new to Chictopia! When theweeone reaches 200 Chic Points, she will be in the Style Council!